By Keith Cowing on September 28, 2016 8:34 PM. "I have deep moral qualms about this idea, as it appeals to a small fraction of humankind and proposes what would inevitably be an elitist enterprise. Would it be ethical to enable people with enough money to buy a ticket to leave our troubled Earth behind? Would it be ethical for government(s) to subsidize such an enterprise? In Musk's disturbing "vision" - a nightmare in my mind - how many poverty-stricken Bangladeshis or Congolese, how many permanently displaced Syrian refugees, will come up with $200,000 - or $2,000, for that matter - to "start anew," as the colonization zealots say they want to do? I participated in a conference this past weekend about "social and conceptual issues in astrobiology." Among the questions we 30 attendees were asked to consider in our discussions were: "Should humans seek to exploit and/or colonize space? If so, how should this be done? Are there truly universal principals of biology, psychology, morality, etc. that would apply to extraterrestrial life?" My views on these questions are: No. We should not do it. No." Keith's note: I have known Linda for 30 years and have a lot of respect for her work. But I thought this whole "but people are starving in [fill in the blank]" or "why spend money in space when we should spend it on Earth" mindset was a thing of the 1960 and 1970s. If you want to go after budgets to fix social inequalities then NASA is not the place to start - there is much more low hanging fruit elsewhere. Decades of public opinion polls, popular media, and other cultural phenomena strongly point to a public viewpoint on space that is exactly opposite of what Linda claims. Moreover her viewpoint flies in the face of human history. People explore. Then they colonize. Then they move on to explore some more because that is what people do. In particular I am not certain why this tiny group of 30 space people (no doubt the usual suspects at meetings like this) meeting in their little echo chamber is in any way representative of what America's 300+ million - or the billions who live elsewhere think about exploring space. Look at China and India - countries with vast, pressing social issues - issues that surely could use more money. Yet these countries are dedicating large resources toward exploring space - often times repeating what other countries did decades ago. What is it that they have discovered about exploring space that space people in America seem to have forgotten? Meanwhile, as NASA runs in circles with inadequate budgets driven by plans that they were never going to be capable of implementing, the private sector has amassed the resources to do things on their own in space - for their own reasons. Keith's personal note: I am eternally fond of Linda. We worked together at NASA Life Science Division in the 80s. She knows her Astrobiology. Much of NASA's Planetary Protection policies are the result of her hard work. That said, I do not agree with her opinions about humans on Mars. That said, she's still a true believer in the exploration of space. By Keith Cowing on September 26, 2016 3:17 PM. By Keith Cowing on September 26, 2016 12:12 PM. "Images obtained by NASA's MErcury Surface, Space ENvironment, GEochemistry, and Ranging (MESSENGER) spacecraft reveal previously undetected small fault scarps-- cliff-like landforms that resemble stair steps. These scarps are small enough that scientists believe they must be geologically young, which means Mercury is still contracting and that Earth is not the only tectonically active planet in our solar system, as previously thought." By Keith Cowing on September 26, 2016 11:04 AM. "Scott Pace, a former NASA official, said that any company attempting to do as much as SpaceX needed to carefully assess whether it was pushing its workers too hard. "It would be ambitious for any company to do a schedule like that," Pace says. "When you look at changes in launch schedule that are increasing over historical norms, you should be worried whether or not schedule pressure is putting unacceptable strains on the workforce." SpaceX rejects out of hand the idea that it is pushing its workers too hard." 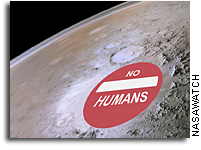 "It also seems likely that NASA won't offer substantial support, either. The space agency is building its own heavy lift rocket, the Space Launch System, and has its own #JourneyToMars. 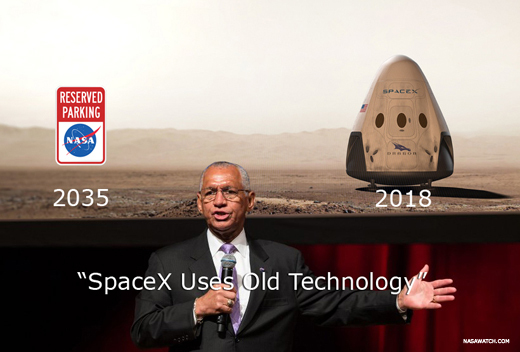 NASA's administrator, Charles Bolden, has wholeheartedly supported SpaceX and commercial space activities in low-Earth orbit, but has been far less effusive about private businesses venturing into deep space on their own. Earlier this month Bolden flatly stated he was not a "big fan" of private companies building heavy-lift rockets. With its Falcon Heavy and BFR, that is exactly what SpaceX is doing." By Keith Cowing on September 26, 2016 7:32 AM. By Marc Boucher on September 23, 2016 2:35 PM. "At this stage of the investigation, preliminary review of the data and debris suggests that a large breach in the cryogenic helium system of the second stage liquid oxygen tank took place. All plausible causes are being tracked in an extensive fault tree and carefully investigated. Through the fault tree and data review process, we have exonerated any connection with last year's CRS-7 mishap." "... Pending the results of the investigation, we anticipate returning to flight as early as the November timeframe." By Marc Boucher on September 23, 2016 12:00 PM. "In a keynote speech here Sept. 22 at the AMOS conference, Frank Rose, the assistant secretary of State for arms control, verification and compliance, said that the upcoming discussion would likely include talk of space debris. While representatives from the U.S. and China have met previously to talk about civil uses of space, the two sides met for a separate discussion of military space topics for the first time in May. Space debris has been a divisive issue between the countries for nearly a decade." "A senior Pentagon official said the U.S. Air Force will need to rethink how it issues satellite collision warnings when a new space object tracking system goes online or risk overwhelming satellite operators and hardware systems with overly cautious alerts." Marc's note: This isn't an issue that's going to go away. All nations must eventually sit down and deal with space debris. And its going to come at a cost. A safe, secure space environment is in everyone's best interest. Next Thursday, September 29th at 2:30 pm ET, SpaceRef will broadcast live the International Astronautical Congress plenary session "Projection and Stability of the Orbital Debris Environment in the Light of Planned Mega-Constellation Deployments" which deals with space debris. By Marc Boucher on September 22, 2016 12:16 PM. 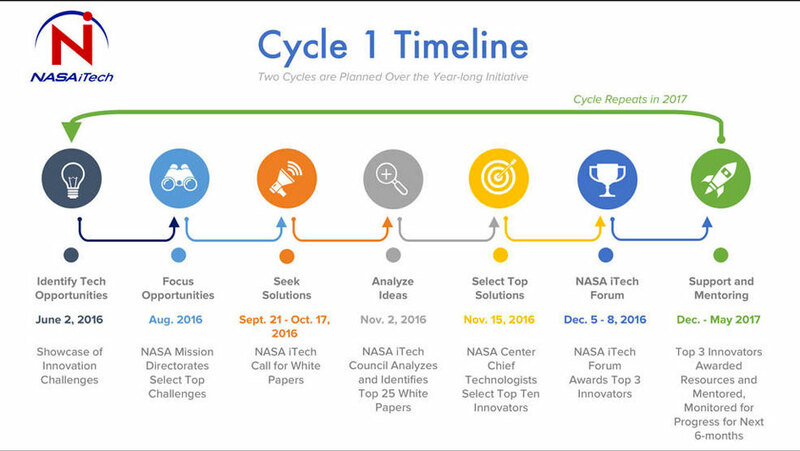 "Now available is the September 21, 2016 NASA Future In-Space Operations (FISO) telecon material. The speakers was Philip McAlister (NASA HQ) who discussed "NASA Collaboration with SpaceX's Red Dragon Mission". "Expertise, input and advice from seasoned NASA engineers will improve SpaceX's chances of nailing the first commercial landing on Mars as soon as late 2018, a senior space agency official said Wednesday, but Elon Musk's space transport company will likely seek more independence from U.S. government support on later expeditions to the red planet." Programming note: SpaceRef will broadcast live Elon Musk's presentation, Making Humans a Multiplanetary Species, from the International Astronautical Congress in Guadalajara next week on Tuesday, September 27 at 2:30 pm ET. Marc's note: We certainly live in a new age of exploration when a private space company is embarking on a mission that no government has yet to undertake. That mission, to send an uncrewed technology demonstration human spacecraft mission to land on Mars has never been attempted. And make no mistake this is not the spacecraft that SpaceX would send to Mars with humans. It's a technology demonstration. The data collected by this mission will be invaluable to future manned missions to Mars and elsewhere. Continue reading As SpaceX Heads to Mars with its Red Dragon Program, NASA Tags Along, A Win-Win for Both. By Marc Boucher on September 20, 2016 2:41 PM. "Now available is the September 7, 2016 NASA Future In-Space Operations (FISO) telecon material. The speakers were Mark Lupisella, Jack Bleacher and Michael Wright of NASA GSFC who discussed "Low-Latency Teleoperations for the Evolvable Mars Campaign". By Keith Cowing on September 20, 2016 12:27 PM. 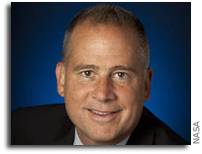 Keith's note: Sources report that NASA Associate Administrator for the Office of Communications David Weaver is leaving the agency for a position at the Air Line Pilots Association (ALPA). "David Weaver became NASA's associate administrator for the Office of Communications on July 18, 2010. Weaver is a senior public administration professional with 25 years of experience in government, politics, media relations and public policy." By Marc Boucher on September 19, 2016 3:08 PM. "Now available is the August 31, 2016 NASA Future In-Space Operations (FISO) telecon material. The speaker was Jim Bell (ASU) who discussed "Telerobotics from Mars Orbit - Lessons from Robotic Exploration for Human Missions to Mars". By Keith Cowing on September 19, 2016 9:38 AM. "The next Future In-Space Operations (FISO) colloquium will be Wednesday, September 21, when we will host Philip McAlister (NASA HQ), who will speak on "NASA Collaboration with SpaceX's Red Dragon Mission." Keith's note: Elon Musk is getting ready for his big Mars colonization plan presentation at the IAC next week. The first step in this path to Mars is the Dragon mission that SpaceX is planning to send to Mars in 2018. You'd think that NASA would want people to know how it is involved in all of this. Indeed, NASA's Director of Commercial Spaceflight Development Phil McAlister is making a presentation at this week's NASA FISO telecon. Yet no mention is made of this presentation on NASA's calendar, Journey To Mars page, NASA's Commercial Space Transportation page, or anywhere else at NASA.gov. Why is NASA hiding this briefing? Is NASA afraid to be seen supporting a competing plan for the #JourneyToMars ? By Keith Cowing on September 19, 2016 9:20 AM. "Musk dropped a surprise on Twitter. The workhorse spacecraft that will carry approximately 100 tons of cargo or 100 people to the surface of Mars, which until now has been popularly known as the Mars Colonial Transporter, can't be called that, Musk said. "Turns out MCT can go well beyond Mars, so will need a new name..." he tweeted on Friday evening. By Saturday evening he had a new name dubbing the spacecraft the "Interplanetary Transport System," or ITS." "So far, Musk has only teased details of planned missions to Mars: both manned and unmanned. The first unmanned probe from SpaceX will be sent to the planet "as soon as 2018," it was said in June. Musk added that probes would be launched by SpaceX every two years, before humans are landed on the planet in 2025." By Keith Cowing on September 19, 2016 8:18 AM. "International Launch Services (ILS) announces a product line extension of the Proton Breeze M commercial launch vehicle designed to expand the addressable GEO market for cost effective launch solutions in the small and medium satellite class range (3 to 5 metric tons). Designated as "Proton Variants," these two additional vehicles will be optimized 2-stage versions of the time tested and flight proven Proton Breeze M launch system for exclusive commercial use by ILS." By Keith Cowing on September 16, 2016 5:27 PM. "U.S. Sens. Ted Cruz (R-Texas), Bill Nelson (D-Fla.), Marco Rubio (R-Fla.), Gary Peters (D-Mich.), Roger Wicker (R-Miss. ), and Tom Udall (D-N.M.) today announced the introduction of S. 3346, The National Aeronautics and Space Administration (NASA) Transition Authorization Act of 2016. The legislation provides stability for NASA to sustain and build upon existing national space investments designed to advance space exploration and science with an overall authorization level of $19.508 billion for fiscal year 2017." By Marc Boucher on September 16, 2016 12:23 PM. "China launched the Tiangong-2 space laboratory module on a Long March 2F rocket today. The two year year mission of Tiangong-2 will see two Chinese astronauts occupy the space lab for up to a month at a time to perform a variety of scientific experiments. In October, Shenzhou 11, will launch with two astronauts on the first mission to the newly commissioned space lab." Keith's note: As I said on CCTV in an earlier interview today I think that it is time that the U.S. and China started to expand their cooperation in space including human space flight. This will need to be done by Congress by ending the politically-oinspired ban that is currently in place. Marc's note: As China moves forward with its human spaceflight program should the International community and the U.S. forge closer ties with them? My position is that international cooperation in space is critical for the continual peaceful use of space, and for the commercial use of LEO, GEO, the moon and future scientific exploration beyond the moon. This then would include cooperation with China. By Keith Cowing on September 15, 2016 8:52 PM. Keith's 15 Sept note: With regard to the Open NASA thing at FOIA this report says "NASA's FOIA program provides access to agency documents through a citizen-centered service. NASA is committed to providing the public with excellent customer service as well as access to disclosable agency documents in accordance with all appropriate laws and regulations. Each Plan listed improvements, consolidations, and revised processes. Each of these commitments was met, and the effort to provide excellence continues. http://socialforms.nasa.gov/foia"
"Not Found The requested URL /foia was not found on this server. Apache/2.4.7 (Ubuntu) Server at socialforms.nasa.gov Port 443"
+ View Form" - it also links to http://socialforms.nasa.gov/foia which leads you to the same dead link. So much for enhanced customer service by the NASA CIO. By Keith Cowing on September 14, 2016 11:54 PM. Keith's note: Rich people giving each other awards. I rented the National Air & Space Museum - twice - for NASA In the late 80s as a NASA contractor employee. I have been to a bunch of them over the years. I know what these receptions cost. This one was easily $50K - and most of the money went to caterers. To his credit, Jeff Bezos gave his $250,000 award to SEDS (Students for the Exploration and Development of Space) - an organization that Bezos once belonged to as a student. If only these rich people could skip the overhead that goes with these dress-up events and write checks to organizations that matter. The cost of this reception alone could have put someone through college. I get invited to this thing every year and refuse to attend. The space community has convinced itself that it needs to have parties like this to make themselves feel good about whatever it is they do. Instead of receptions in fancy museums in DC why not write the checks that would pay for that party to fund students, small start-ups, and other "little" things that will have an actual difference. 99.999% of americans have no idea who the space elite are or what they do. Regular folks worry about their jobs and their kids' future. The space community needs to pivot away from this self-indulgence and focus on the taxpayers who pay for all of their toys. As long as the populace sees no clear value to space exploration and has no personnel connection to it they are not going to rise up to save it when budgets start to get thin. One candidate for the presidency has wondered aloud whether potholes and crumbling infrastructure should be given priority over more funds for NASA. To be honest, in the minds of the vast majority rational folks who work hard every day to feed their families, better roads to cut their commuting times are far more likely to be seen as having an effect on their lives than some rocket to another planet. And yet the space people have big parties that they invite one another to. This must have been what it was like when Rome was burning. By Keith Cowing on September 13, 2016 11:09 PM. "On Tuesday, during a Q&A session at the American Institute of Aeronautics and Astronautics' Space 2016 Conference, Bolden was asked for his opinion on the emerging market for small satellites and launchers. He chose to respond instead with his thoughts on NASA's own rocket, the Space Launch System, and private-sector development of larger launch vehicles. "If you talk about launch vehicles, we believe our responsibility to the nation is to take care of things that normal people cannot do, or don't want to do, like large launch vehicles," Bolden said. "I'm not a big fan of commercial investment in large launch vehicles just yet." Keith's update: Hey Charlie, normal people seem to be building rockets at a much lower cost than NASA people can. Just sayin'. As for "commercial investment in large vehicles", newsflash: that's not your money they are investing. Its theirs. Ask Steve Jurvetson, that guy you spoke with at AIAA today. As for your comment about "normal people" (who are they, BTW?) and their inability to build rockets is contrary to the open access, inclusive, Maker-oriented, commercial space policy advocated by the Obama Administration. You are retiring from NASA soon, yes? By Keith Cowing on September 13, 2016 8:19 PM. Keith's note: According to this press release from Deals Secure Group Holding Company GP, Elite Capital & Co. Limited, and Dr. Faisal Khazaal, LLD. Law Group, LP: "Dr. Khazaal was one of those who participated in the funding of the spacecraft LightSail. Being recognized for his participation he was granted ownership of a square centimeter of this spacecraft as a symbolic property for his belief in the importance of space science." According to the Planetary Society "We also collected 440,000 names from well-wishers that wanted to symbolically join the seven-year mission. One copy of those names is stored aboard the spacecraft's sample return capsule, and will plunge back to Earth in 2023. Another copy, aboard OSIRIS-REx itself, will slip into a permanent heliocentric orbit." Putting people's names on a small data storage device in a spacecraft is a long-standing NASA tradition. But, since when does the Planetary Society get to give someone "ownership" of a piece of an active NASA spacecraft - symbolic or otherwise? And why is this being done in exchange for someone funding a non-NASA project like LightSail? The OSIRIS-REx spacecraft belongs to the taxpayers who paid for it - not donors to a non-profit organization. Usually when a press release about a NASA mission is issued, NASA has to approve it. That is apparently not what happened here. I have asked NASA PAO for clarification. Keith's update: According to one of my reader's posted comment - just posted - "One of the LightSail Kickstarter perks is a certificate with a 1cm square of the extra light sail material." As such this may be an example of lack of a skilled editor who is on the alert for bad writing i.e. what does "this spacecraft" mean? The press release is about OSIRIS-REx - bad grammar certainly serves conflate/equate the issuer's LightSail donation and OSIRIS-REx. That said NASA PAO says that it did not see this press release prior to its issuance and are checking the facts behind its statements. That is not how NASA EPO partners are supposed to work these things. Having a skilled set of eyes at PAO can avoid misleading press releases like this. Planetary Society and University of Arizona need to get their act together in this regard. Its a long mission, so there is time to tweak the EPO. By Marc Boucher on September 13, 2016 2:48 PM. Marc's note: There are a couple of noteworthy commercial launch news items today. ILS is introducing an expanded Proton line in an effort to capture part of the small to medium satellite market. ULA meanwhile is offering launch to customers within as little three months of booking an order. No pricing was provided for either of these news items. "International Launch Services (ILS) announces a product line extension of the Proton Breeze M commercial launch vehicle designed to expand the addressable GEO market for cost effective launch solutions in the small and medium satellite class range (3 to 5 metric tons). Designated as "Proton Variants," these two additional vehicles will be optimized 2-stage versions of the time tested and flight proven Proton Breeze M launch system for exclusive commercial use by ILS." "United Launch Alliance (ULA) announced a new, revolutionary service called RapidLaunch™ which provides the customer the fastest schedule from the initial order to launch service in the industry today. "The priorities of all of our customers include ensuring their spacecraft launches on schedule, securing the soonest possible manifest date and completing the mission with 100 percent success," said Tory Bruno, ULA CEO and president. "To address these priorities, we have been working on this offering for more than a year, which allows our customers to launch in as few as three months from placing their order." By Keith Cowing on September 12, 2016 1:02 PM. "Named in honor of John Glenn, the first American to orbit Earth, New Glenn is 23 feet in diameter and lifts off with 3.85 million pounds of thrust from seven BE-4 engines. Burning liquefied natural gas and liquid oxygen, these are the same BE-4 engines that will power United Launch Alliance's new Vulcan rocket. The 2-stage New Glenn is 270 feet tall, and its second stage is powered by a single vacuum-optimized BE-4 engine. The 3-stage New Glenn is 313 feet tall. A single vacuum-optimized BE-3 engine, burning liquid hydrogen and liquid oxygen, powers its third stage. The booster and the second stage are identical in both variants." By Keith Cowing on September 9, 2016 6:15 PM. "So if NASA makes 20 SLS flights by the end of the 2030s, the rocket will roughly cost the agency a total of $60 billion, or $3 billion per flight. Now imagine NASA issuing a Request for Information for heavy lift in 2011. Say the agency was willing to pay a fixed-price sum of $10 billion to a private company to develop a 100-ton heavy lift launch vehicle and a per flight fee of $500 million. Either SpaceX, United Launch Alliance, or another company (Blue Origin, perhaps) certainly would have been capable of delivering a flight-ready rocket within a decade. After buying 20 launches, NASA would still have $40 billion left to spend on things other than rockets. During this decade, then, the agency could have focused on deep space habitats, landers, in-space propulsion, Mars gravity studies, and more. When the private rocket was ready to go in 2021, NASA would be prepared to fly meaningful missions. This isn't a hypothetical, by the way. Back in the late 2000s, United Launch Alliance outlined a path of upgrades for its Delta IV Heavy rocket that included derivatives (based upon an innovative ACES upper stage and new engines) that could get 90 tons or more to low-Earth orbit. This could be flying today for less than $10 billion. This was common knowledge to NASA and the aerospace community at the time SLS came into existence, but Congress wasn't interested." By Keith Cowing on September 9, 2016 10:08 AM. Keith's 29 September update: Sources report that a substantial portion of the contractor staff working for the SLS safety contractor at NASA MSFC QD34 want out and are asking for reassignment to other programs. Many are openly looking for new jobs elsewhere. The prime contractor has been told by NASA MSFC management that if anyone leaves SLS safety support without permission or by other than NASA-directed termination that the incumbent contractor risks not receiving consideration during the contract re-competition next year. SLS safety risks under development are being deleted. People are scared to come forward with issues. SLS management was at Michoud and Stennis for an AOA yesterday and today. This was reportedly a topic for discussion. By Keith Cowing on September 8, 2016 6:03 PM. By Keith Cowing on September 7, 2016 4:51 PM. By Keith Cowing on September 6, 2016 11:51 AM. "Over its life, the Orion Program has experienced funding instability, both in terms of overall budget amounts and the erratic timing of receipt of those funds. In past reports, we noted that the most effective budget profile for large and complex space system development programs like Orion is steady funding in the early stages and increased funding during the middle stages of development. In contrast, the Orion Program's budget profile through at least 2018 was nearly flat and Program officials acknowledged that this funding trajectory increased the risk that costly design changes may be needed in later stages of development when NASA integrates Orion with the SLS and GSDO. In addition, Orion officials noted that the timing of appropriations affected their ability to perform work as planned, with the Program receiving its funding between 4 and 8 months after the start of fiscal years 2012 - 2016. ... Finally, the Program is working toward an internal planned launch date significantly earlier than the Agency's external commitment date or estimates by an independent review board. We are concerned that such an optimistic approach, given the Program's flat budget profile, increases the risk that Orion officials will defer certain tasks, which ultimately could delay the Program's schedule and increase costs." By Keith Cowing on September 5, 2016 12:35 PM. "Israel's Space Communication Ltd said on Sunday it could seek $50 million or a free flight from Elon Musk's SpaceX after a Spacecom communications satellite was destroyed last week by an explosion at SpaceX's Florida launch site. Officials of the Israeli company said in a conference call with reporters Sunday that Spacecom also could collect $205 million from Israel Aerospace Industries, which built the AMOS-6 satellite. SpaceX said in an email to Reuters that it does not disclose contract or insurance terms. The company is not public, and it has not said what insurance it had for the rocket or to cover launch pad damages beyond what was required by the Federal Aviation Administration, which oversees commercial U.S. launches, for liability and damage to government property." "The satellite's owners, Space Communication, will receive over $173 million from IAI plus interest, which provided insurance for the device, a company official said. According to Space Communication, also known as SpaceCom, the total sum from IAI is "approximately $205 million." Under the insurance policy, IAI will have to pay the amount "in under 60 days," a spokesperson for the quasi-governmental firm said. In addition, the Israeli company said it expects to receive either $50 million from SpaceX or "have the launch of a future satellite carried out under the existing agreement and with the payments that have [already] been made." "With its launch pad likely facing major repairs, SpaceX said it would use a second Florida site, called 39A, which is located a few miles north at NASA's Kennedy Space Center and was used for space shuttle missions. The pad is on schedule to be operational in November, SpaceX said. The company had planned to use the pad for the first time later this year for a test flight of its new Falcon Heavy rocket. NASA spokesman Michael Curie said in an email that the site could be used for commercial and government flights, and SpaceX President Gwynne Shotwell in a May conference said one customer, SES SA of Luxembourg, had expressed interest in flying from the historic launch pad." Does SpaceX Need to Adjust its Priorities? By Keith Cowing on September 3, 2016 4:08 PM. "I understand SpaceX has a master plan--the company wants to colonize Mars. It has been brilliant to watch the plan unfold as SpaceX has used NASA contracts to bootstrap up to the Falcon 9 rocket and used Falcon 9 flights to simultaneously test reusability and supersonic retropropulsion for the Martian environment. I mean, it's genius. But at some point you have to focus on the here and now, and that is the Falcon 9 rocket. The Falcon 9 rocket lies at the core of everything SpaceX wants to do. It delivers commercial satellites and cargo. It will deliver astronauts into orbit. Three Falcon 9 boosters will power the Falcon Heavy. It is the basis of proving the reusability of orbital launch systems. So if there is no Falcon 9, there is no business. And now there have been two failures in 15 months. While the cause of the second failure is not known to outsiders, and it may have been caused by ground systems rather than the rocket itself, the company has nonetheless lost two of its rockets and associated payloads in 15 months. That is sobering." By Marc Boucher on September 3, 2016 9:26 AM. Marc's update: Friday evening SpaceX provided an update on the explosion at their Cape Canaveral SLC-40 launch pad. My interpretation of the statement leads me to think that as long as the investigation reveals no issues related to the Falcon 9 itself, that SpaceX intends on going forward with launches from their two other pads at Vandenberg Air Force Base and Launch Complex 39A at Kennedy. "As for the Launch Pad itself, our teams are now investigating the status of SLC-40. The pad clearly incurred damage, but the scope has yet to be fully determined. We will share more data as it becomes available. SpaceX currently operates 3 launch pads - 2 in Florida and 1 in California at Vandenberg Air Force Base. SpaceX's other launch sites were not affected by yesterday's events. Space Launch Complex 4E at Vandenberg Air Force Base is in the final stages of an operational upgrade and Launch Complex 39A at Kennedy Space Center remains on schedule to be operational in November. Both pads are capable of supporting Falcon 9 and Falcon Heavy launches. 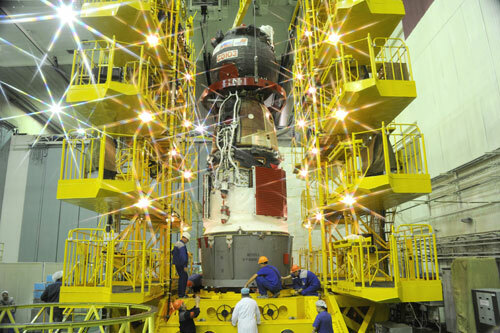 We are confident the two launch pads can support our return to flight and fulfill our upcoming manifest needs." Continue reading Explosion at SpaceX SLC-40 Pad (Update). By Keith Cowing on September 2, 2016 7:24 PM. "Boeing has already said it would have to push back its first crewed flights to early 2018. SpaceX has maintained that it would fly by the end of 2017. But the IG investigators weren't buying either of those timetables: "Notwithstanding the contractors' optimism, based on the information we gathered during our audit, we believe it unlikely that either Boeing or SpaceX will achieve certified, crewed flight to the ISS until late 2018." "Sources at Johnson Space Center, which plays a secondary role in managing the commercial crew program to Kennedy Space Center, have privately told Ars for months that neither Boeing nor SpaceX would fly in 2017. Moreover, these sources have said, it will be fortunate if either company launches test flights, with crew, during the second half of 2018. The key factor to watch now is whether NASA procures additional seats from the Russians to deliver NASA astronauts to the International Space Station in 2019 and beyond." "Moreover, both companies must satisfy NASA's safety review process to ensure they meet Agency human-rating requirements. As part of the certification process, Boeing and SpaceX conduct safety reviews and report to NASA on potential hazards and their plans for mitigating risks. We found significant delays in NASA's evaluation and approval of these hazard reports and related requests for variances from NASA requirements that increase the risk costly redesign work may be required late in development, which could further delay certification. Although NASA's goal is to complete its review within 8 weeks of receipt of a hazard report, the contractors told us reviews can take as long as 6 months. We also found NASA does not monitor the overall timeliness of its safety review process. Given delays in the Commercial Crew Program, NASA has extended its contract with Roscosmos for astronaut transportation through 2018 at an additional cost of $490 million or $82 million a seat for six more seats. If the Program experiences additional delays, NASA may need to buy additional seats from Russia to ensure a continued U.S. presence on the ISS." By Keith Cowing on September 2, 2016 12:09 AM.